Te Aito means “The Warrior”. 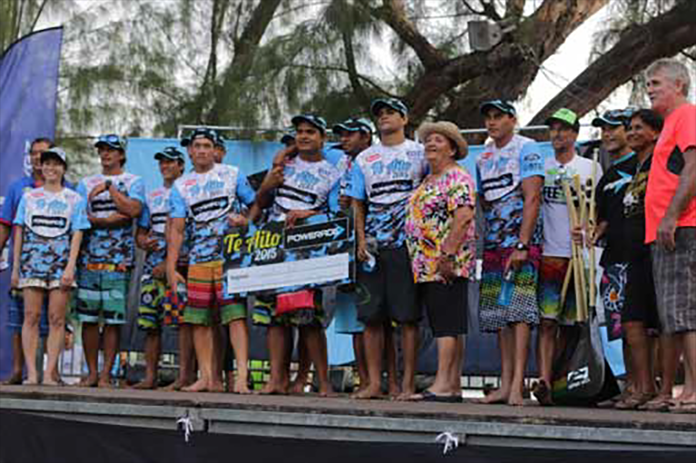 Te Aito Tahiti is the largest one-man canoe race in the world, and is the qualifying race for the Super Aito. The top 100 finishers of Te Aito qualify to race in Super Aito one month later. 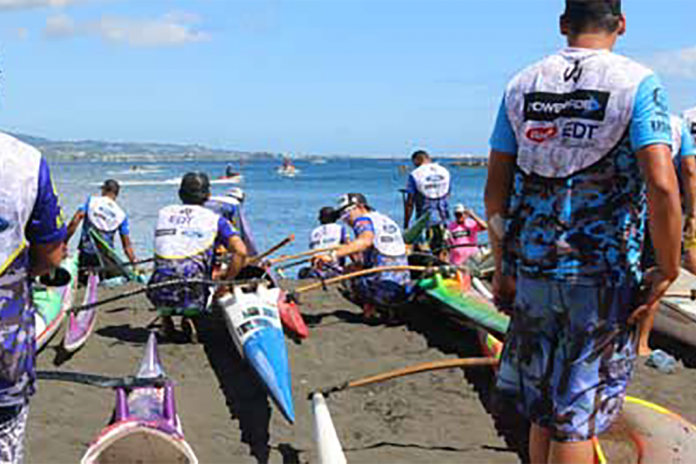 In the 2015 Te Aito there were 428 paddlers in the Open Men’s heat alone. Included in the Te Aito, were shorter courses for Vahine (Women) and Veterans, (Masters) and multiple Junior. and Tama (Keiki) divisions. Everyone who paddles, should try this race as it was an eye opening experience. Chauncey Cody and I, along with my wife Lori, arrived in Tahiti one week before the race. We did the tourist thing on Tahiti Island the first day. We drove around the Island, checked out the beaches, va’a park, and got a tour of the Fai Va’a shop. 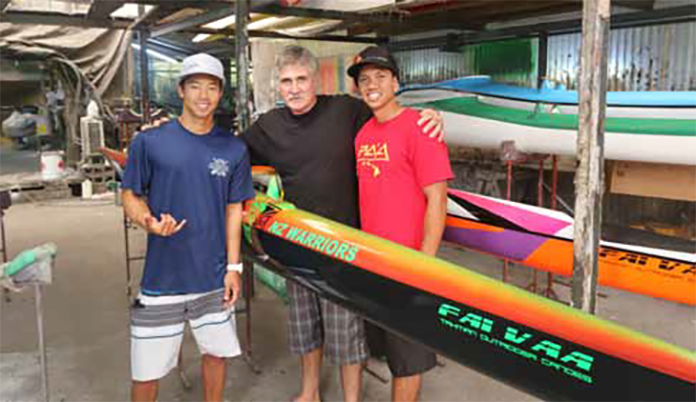 Joe Bunton, owner of Fai Va’a, was generous enough to provide Chauncey and me with canoes for the race (He even delivered the canoes himself to our hotel so we could practice the course before the race). Our hotel was located on the beach right in the middle of the race course, which made it a perfect spot to launch from. On race day we paddled to the start from our hotel, making sure to get there at least 3 hours before the race. We still had to check-in, get our race jerseys and stickers, and line up our boats on the beach. We wanted to get a good spot on the beach, although we really weren’t sure where the “good” spots were. Surprisingly when we arrived at the start there was a lot of room on the beach. The Vets’ canoes were all lined up in their own boundary, which left a lot of room for the Open Men to place their canoes. We heard the “outside” or closer to the point was a good place to start so we placed our canoes near the point. After the Masters started, we moved our canoes again, even closer to the point, but in the second row. I didn’t want to be in the front row because I assumed I would end up blocking a lot of faster paddlers be-hind me and I didn’t want to be “that guy”. With the canoes lined up, all there was left to do was stretch, hydrate, wait for the Vets to finish, and stretch more. We found some shade on the grass away from the beach and tried to relax, but I was getting very nervous. I worried about flipping at the start, cramping up during the race, and yes, being that guy! That was my worst fear. About 30 minutes before start we walked over to our canoes being so nervous I almost threw up. There were a lot more boats on the beach now, and at least 4 rows of canoes situated where we were, and boats lining the beach as far as the eye could see. Everyone began standing next to their canoe, the guys in the front row would slowly inch their way forward. A rope on the sand indicated where the start line was, but it was getting pushed closer and closer to the water by the paddlers. The canoes were packed very close to each other, some just sitting on top of others. Every canoe had another canoe under its iato. The announcer was doing a count-down, in French, so we had no idea when the start was going to happen. We just tried to keep an eye on the guys in front of us. Then it started. I ran into the water and stuck the nose of my boat under the iato of the boat in front of me and started to paddle like crazy. All of the boats were touching hull to ama. All you could do was paddle on the left side and hope to break free from the guys next to you. As we started going, a canoe on my left started spinning out in front of me. I was able to just get around him, but Chauncey and a few other paddlers weren’t so lucky. Then there was a brief opening of clear water in front of me so I started sprinting, but before I knew it I was running into guys who stopped paddling. I didn’t understand what they were doing so I just tried to keep paddling. Once I had the luxury to look more than a boat length ahead me, I was amazed to see not only how many boats were already in front of me, and how far ahead they were. At that point I was afraid to look behind, because I thought there would be no one there! The first part of the race was a down-wind section outside the reef, then upwind with a section inside then outside the reef, for two laps. All I could think of was try-ing to conserve energy on the first lap and making sure I didn’t die out on the second lap, or cramp up. During the upwind section inside the reef it was very hard to pass anyone. There were so many paddlers, that the reef forces the paddlers to be very close (in the pack I was in) and there really wasn‘t any room to pass. It feels like you’re kind of stuck in the position you entered the reef. As you exit the reef you begin to fight the wind waves. The majority of the paddlers tucked in behind a cliff to stay out of the wind. Al-though it was a longer distance, it seemed like most paddlers believed it was the better line. I didn’t do this. I followed a few paddlers who just followed the straight line to the next buoy. I think I lost some positions during this upwind section so I decided to tuck in behind the cliff on the next lap. As I made the turn, feeling pretty good. I did a short sprint out of the turn, and to my surprise, I started passing a few boats. My downwind section on the second lap went pretty well, making up a few positions. Started the upwind section inside the reef again with another tight pack of canoes. It was very crowded and got pushed outside a few of the channel markers and over the shallow reef. In an effort to get away from the pack and sprinting to get around a few boats, and to pass the boat I was shooting for, my right leg cramped up, in pain and not knowing what to do, slowly staying in the race, other paddlers began passing me on the left and on the right (I thought my race was over). Finally stopping to lay back and stretch, the cramping continued, so I ended up just paddling without engaging my legs, and stopping occasionally to stretch. Continuing to do this for about one mile, the cramp finally went away, getting back to the intensity of the race, my left leg began to cramp. At this point I was felling really depressed, feeling sad that I came all this way, to only to cramp up and “do junk”. Gathering myself, I stopped to stretch and dropped the intensity, and after a mile or two the cramp was finally gone. Finally, getting back into the groove, and feeling better, I continued to bring up my intensity. At about a mile left, race officials on Jetskis were yelling out positions, but of course, I had no idea what they were saying. Paddlers near me seemed to be picking up the pace, as I was just trying to hold my position. Feeling good again, and rounding the last buoy before the finish, the realization of finishing a race that I’ve watched on YouTube a million times, made me do a final push to the finish into the crowd of canoes and people just cruising in the water. Many hugs, handshakes, and congratulating were everywhere. I had no idea what place I finished, but I was thrilled to have actually made it to Tahiti, and competed in Te Aito! The whole experience in Tahiti was great. The race organizer, Charley Maitere, was very helpful to me and all the other international paddlers. The organizers even put together a pre-race meeting just for all the international paddlers to welcome us. Joe Bunton from Fai Va’a was also very generous as usual, and provided almost all the canoes for the international paddlers. The Tahitian community really want to spread the va’a culture around the world and want more people to come and experience largest canoe race in the world. I think every paddler should do a race in Tahiti and experience another level of paddling that exists. Till next time, A hui hou! Next articleIsland Native: Vaimana Conner – A Man of the Land, Sea and Air…He’s got our backs!